The Posh Retro Classic Mouse from AZIO is made to be a tether-free navigation tool that features a minimalistic, ambidextrous design. 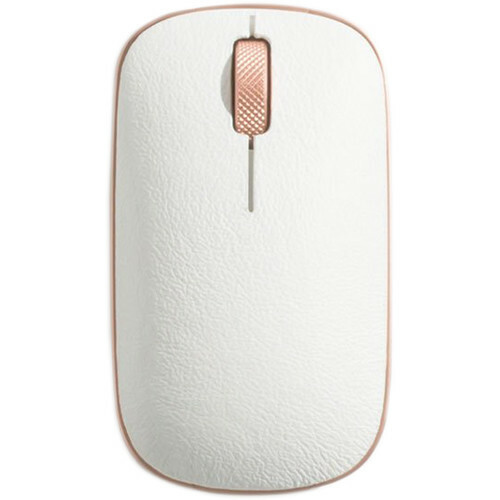 In terms of wireless connectivity, this mouse utilizes Bluetooth and USB RF technology. It also has a PixArt PAW3805EK-CJV1 optical sensor that can reach 400, 800, 1600, and 3000 cpi. This mouse from AZIO has three built-in buttons, including its scroll wheel. A 1000mAh battery and USB Type-C port are onboard for easy recharging. Additionally, a USB Type-C charging cable is included. The Retro Classic Mouse is compatible with Windows and macOS, and is intended to be a companion for your Retro Classic Mouse Pad and Retro Classic keyboards. Utilizing top-grain chrome-tanned leather to provide a pleasant touch, each leather piece is precision-cut, molded in, and hand-trimmed. The mouse pad is made with a genuine leather top cover, textured aluminum wheel, and alloy frame with precision bolts. The scroll wheel design starts with a high-grade aluminum rod that is knurled into a diamond-shaped pattern and completed with chamfered edges on a precision CNC lathe. It is also anodized to enhance aesthetics and durability. The PixArt PAW3805 sensor is designed to track accurately on most surfaces, including glass and other high-gloss materials. Connect wirelessly with Bluetooth or RF via its USB receiver. It works on Bluetooth enabled computers natively, but also includes a USB RF receiver for computers without Bluetooth. The leather top cover can be changed after excessive use to achieve a different look. Charging the mouse is simplified with its USB Type-C port. Unlike older USB ports, the connector doesn't have to be inserted in only one direction.